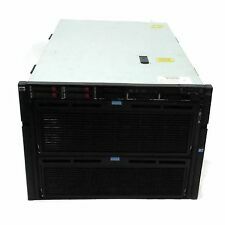 HP SE4255e 2U 4 Node Rack Mount Server 48 Cores 8 x 3.0GHz 6-Core CPU 24 x 2.5"
Hard Drives: 8 x 146GB SAS HDD(10000 RPM). Optical Drive: DVD. But did not affect the performance of the machine. Cores: 2 x 8 Core. Item is fully working condition have few marks or scracthes on it. Rackmount Kit. Part Number – BL460c G6 507779-B21. 2 x 2.5” SAS 146Gb 10k. 64GB (4 x 8GB, 8 x 4GB) PC5300F PC3-8500. HP Smart Array P410 512Mb. Hard Disk Drive 2 x 2.5" Hard Drive Bays. Part Number – R710. Dell Perc 6i. 4 x RJ-45 Gigabit Network. 2 x USB 2.0. 1 x VGA (Video). Interface Ports 2 x PCI-e x8. Expansion Slots. This server can take 4x Hot Plug, Large Form Factor Hard Drives. 1x 445193-B21 - HP ProLiant DL160 G5 Hot Plug SAS/SATA Rack CTO Chassis. 1x 573091-001 - HP DL160 DL180 DL320 G5 Server Rack Rail Kit. 2 x Dual Xeon Quad Core X5365 3.0Ghz. 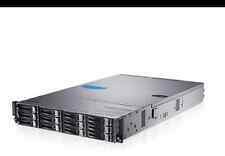 1 x Dell PowerEdge 2900 MKll duel xeon quad core X5365 3.0Ghz (8 core 2 x 4). I won't wipe these drives as these are evals but there are new eval ISO's loaded on the partition to build new. Product Form Factor Rack-mountable - 8U. TypeNo HDD. Server Scalability 8-way. Type Server. OS CertifiedSUSE Linux Enterprise Server, Microsoft Windows Server, Red Hat Enterprise Linux, Oracle Solaris, Oracle Linux. Each node motherboard Bios updated to Version: BIOS R02.06.0007 (Latest) Date: 11/7/2018. We will resolve the problem directly with you. NO RAIL KIT. Supermicro SuperServer 6026TT-BTRF 4-Node 8x Six-Core X5675 192GB Ram. Node P/N: X8DTT-F. On-Board Devices (per Node). Input / Output (per Node). System BIOS (per Node). Front Panel (per Node). Expansion Slots (per Node). 1 xFujitsu Sun SPARC Enterprise 10U M5000 Server. 2 x SPARC 64 VI 2.1GHz Dual Core Processors. Model No: Enterprise M5000. 4 x Fujitsu CA06761-D105 Sun 375-3477-01 CPU Module Each With 8 x Fujitsu CF00541-0545 Sun 541-0545 501-7674 Each With. Sun Microsystems Fire V890 Deskside Server. - 6x 73GB 10K FC-AL Hard Disk Drives. - 32GB RAM. Credit or Debit Card accepted Worldwide. Dell PowerEdge FX2S Including Dell PowerEdge FX2S Blade Server Enclosure (4 x Half Width Bays). 2 x Dell FX2S 1GB 8-Port PassThur I/O Module. No Node Servers Included. Dell PowerEdge is a trademark of Dell Inc. Processor Type - V2. Product Model - E5-2450 V2. Cache - 20MB. Number Of Processor - 8. Processor Speed - 2.50GHz. MPN - 701847-B21R. Model - ML350. Form Factor - Server Processor. 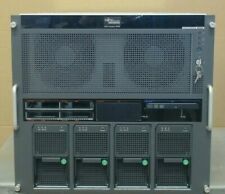 IBM BladeCentre E 8677 4x Blade 8843 8x 64-Bit Xeon 2.8GHz. Model No: BladeCentre E 8677. 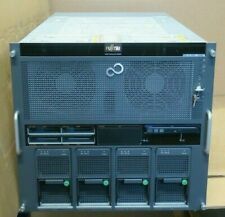 1 x IBM BladeCentre E 8677 Server System. 2 x 64-Bit Xeon @ 2.8GHz. 1 x IBM BladeCenter QLogic 2Gb SFF FC Card - 26K4859. The server is in good condition, it has no ram (Needs DDR2 Type), comes with 4 x 250gb HD’s, caddy’s included. UK shipping only, UK only. Dell PowerEdge M1000e Including Dell PowerEdge M1000e Blade Server Enclosure. Dell M1000e V1.1 Midplane Board. Dell M1000e IKVM Module. 9 x Dell M1000e Fan Modules. 4 x Dell PowerEdge M620 Blade Server (Spec below). 32GB DDR4 RAM. 4 x Dell C6320 Node Server (Spec Below). Dell PowerEdge C6320 Including Dell PowerEdge C6300 Including Dell C6300 Node Enclosure Chassis. Dell X550-T2 10GB Ethernet Converged Network Adapter. 19 "1UGreen IT Server system. HDD 4 x 1TB SATA. 1U heatsink. 1U BTX aluminium heatsink. Speicherkapazität (RAM) 32GB. Arbeitsspeicher (RAM) 32GB. Power switch and LED indicators. 4 x 3.5 "SATA hot-swap drive trays". 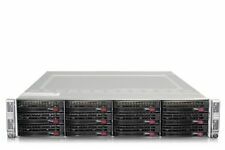 Sun Microsystems Fire X4600 Rackmount Server. - 4x 73GB 10K SAS Hard Disk Drives. 8x 2.6GHz Dual Core AMD Opteron 885 Processors X8105A-Z / 541-1771. - 8x DVD-ROM / 24x CD-Writer Assembly 390-0320. - 4x AC power cables.